Scott Ronald Garland (born July 2, 1970 in Westbrook, Maine) is an American firefighter and professional wrestler who is best known for working with WWF/E and Extreme Championship Wrestling (ECW) under the ring name, Scotty 2 Hotty. He was one-half of the tag-team Too Cool with Grandmaster Sexay and sometimes Rikishi. 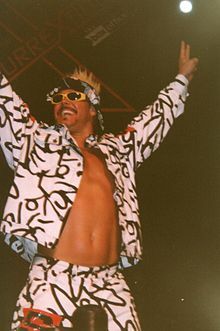 During his time in Too Cool, Garland won the WWE Tag Team Championship 1 time with Rikishi and won the WWF World Tag Team Championship with Grandmaster Sexay. He also defeated Dean Malenko to win the WWF Light Heavyweight Championship on April 17, 2000 but he held the title for only 10 days before he dropped it back to Malenko on April 27, 2000. In February 2013, he began training as a firefighter and graduated from the Lake Tech Fire Academy in Tavares, Florida in June 2013. ↑ "Scotty 2 Hotty's first Light Heavyweight Championship reign". WWE. Retrieved 2013-10-30. ↑ "Where Are They Now? Scotty 2 Hotty". WWE. Retrieved 2013-10-30. ↑ "WWE Tag Team Championships - Scotty 2 Hotty & Rikishi (February 05, 2004 - April 22, 2004)". WWE. Retrieved 2013-10-30. ↑ "World Tag Team Championship - Too Cool (May 29, 2000 - June 25, 2000)". WWE. Retrieved 2013-10-30. This page was last changed on 10 March 2019, at 04:33.